Some time ago we helped develop «Blueprints of Russia, 16-17th centuries» project. 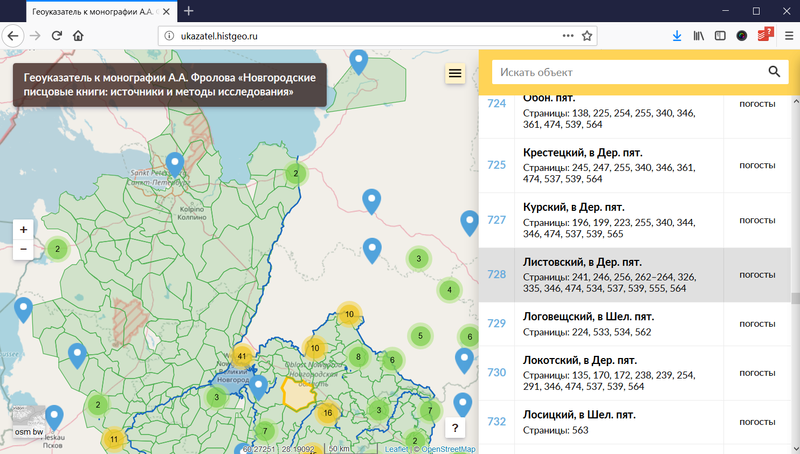 Blueprints are an interactive map that uses NextGIS Web to store and visualize georeferenced documents from Russian ancient documents archive. The tool proved to be easy to use and effective so our collaboration with Institute of World History continued. In a new project, we helped Historial geoinformatics Lab of the institute create a gazeteer – a tool to browse geographical toponyms. The gazeteer allows simultaneously view geographic features linking them to historical texts and vice versa. All data are stored and managed by authors in their nextgis.com instance. Our Web GIS service provides all necessary interfaces to be accessed from external applications (more). As demonstrated by this gazeteer, user interface is not limited to our standard Web map, you can build practically any web map application using our service as a backend. You can find source code for this tool at Github. If need someone to help with creating such tools, let us know!